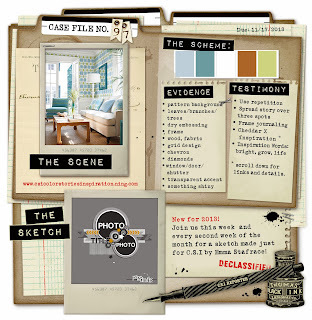 It's Case File #97 over at CSI this week - yet again CSI mastermind Debbi Tehrani has found a perfect Scene for us to investigate. From this image, Debbi has taken the five colours for the Scheme and inspiration for design elements, techniques and journaling. As the second Case File of the month, it also includes a fab sketch from Emma Stafrace at Page Drafts. You can also download the CSI Coordinates - a set of printable words, images and patterned papers especially designed for each Case by the wonderful Michele Singh. Look at this cute picture of my little cousin Josh (not so little now) - isn't he a sweetie?! The Sketch: ALWAYS love Em's sketches! The Scheme: All the colours are there. The Evidence: Patterned background; wood; frame; chevron pattern; transparent accent;something shiny. The Testimony: I journaled over three spots and used the IW "bright". Here is a close-up so you can check that I followed the clues! I love the little photo viewer disc which came in a FrogDog kit and I was well chuffed with the idea of dipping a wooden takeaway spoon in embossing paste to look like icecream! 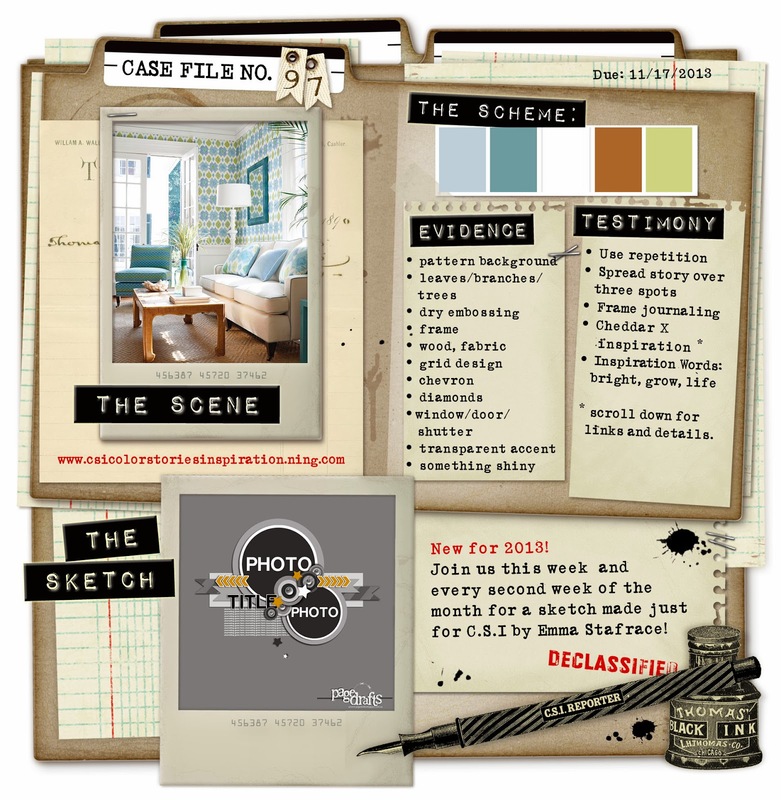 Check out the gorgeous gallery over at CSI to see how everyone else has solved this case - it's always such an inspiration to see so many different interpretations by so many clever scrappers.